Lock in a great price for Villa Altstadtperle Erfurt – rated 8.8 by recent guests! Delightful and quite close to the old city with beautiful churches and great restaurants. Although there is no elevator, it’s only two stories high. There is a very attractive rose garden on the side and also a small onsite parking area. The breakfast buffet was impressive. Location was superb. Parking was good and extra charge. Breakfast was adequate. Fresh breads. Manager (possible the owner) spoke very good English. Parking was right next door. Now that we know what a great town Erfurt is, we will be back. The room was very large and had a complete kitchen. Shower was pretty small, but adequate. The room had a sitting area with a couch, as well. Breakfast was one of the best of our two week Germany trip. wonderful accommodations in a wonderful town! Great front desk staff & the room was spacious and clean. We were on a Martin Luther trail, this was just 2 blocks from where he decided to and became a monk. The place itself was once owned by Martin Luther's friend--so it is historic! Location to the sights is fantastic. On site safe parking. Came with stocked kitchenette. Breakfast was great. Owner reserved us a taxi to the train station. Morning coffee on site along the river. Walkway along the river is just a short distance away. Restaurants are about a 10 minute walk. Extremely helpful and friendly staff. Our room had no street noise #12. We walked to the enormous fortress and visited numerous churches. Martin Luther was in Erfurt for a while. Everything was very clean. Ground level rooms exited to the outside. I would definetly stay here again. Beautiful apartment! Lovely sitting area. Great location for visiting Erfurt. It would have been nice to stay longer. Secure parking. Womderful breakfast. I traveled to Erfurt with my husband and 20yr son. The accommodations were wonderful. We stayed in a one bedroom villa. It was roomy and comfortable. The location of this property was great. Close enough to walk to all the old town attractions, yet it is on a nice quiet street. My favorite part is that this little villa backs up to a river with a beautiful trail. Very peaceful. I looked forward to returning every night. Good location, interesting historical town. On Saturday we found an incredible market with all kinds os flowers, produce, and food trucks. It was great. Very friendly staff, nice location and great breakfast. One of our top picks in Erfurt.Set in the heart of Erfurt’s Old Town, these apartments are only 1,300 feet from Erfurt Cathedral. They offer spacious accommodations with free Wi-Fi access. The bright rooms at Villa Altstadtperle Erfurt are individually decorated with Mediterranean or Alpine-style interiors. Homelike comforts include a flat-screen TV and a seating area with comfortable sofas or cocktail chairs. Villa Altstadtperle provides a hearty breakfast. Erfurt’s main attractions include the Krämerbrücke Bridge (1,300 feet) and Thüringen Zoo (4.7 mi). 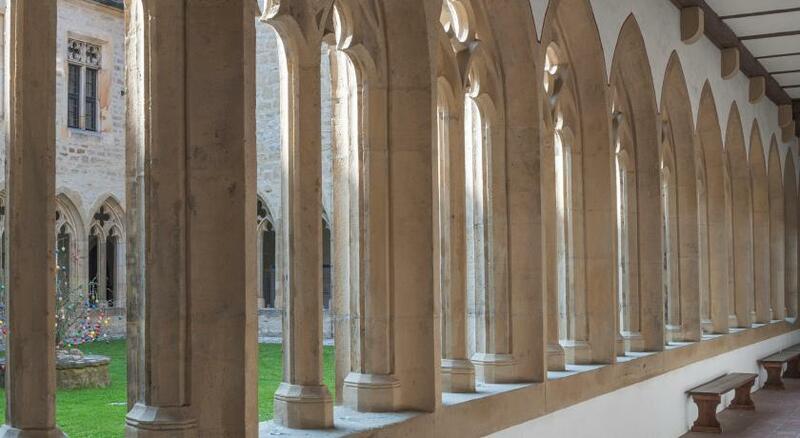 An 11-minute drive takes you to Erfurt Exhibition Center. Access to the A71 motorway is only a 10-minute drive from the guest house. Erfurt Central Train Station is also 0.8 mi away. Private parking is available at the accommodations for an additional charge. 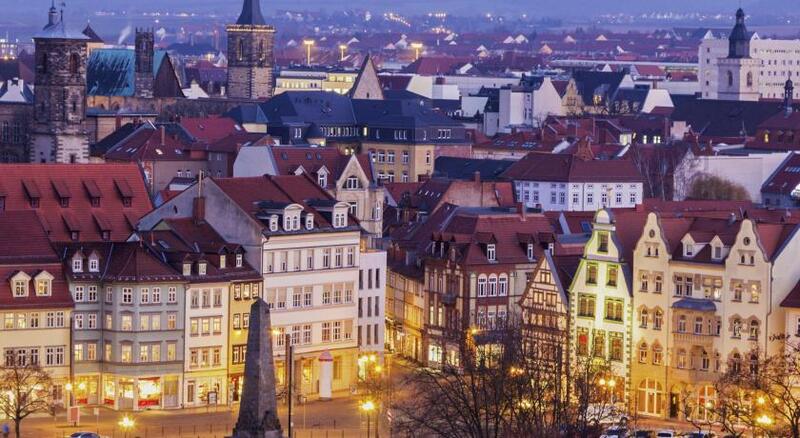 This is our guests' favorite part of Erfurt, according to independent reviews. 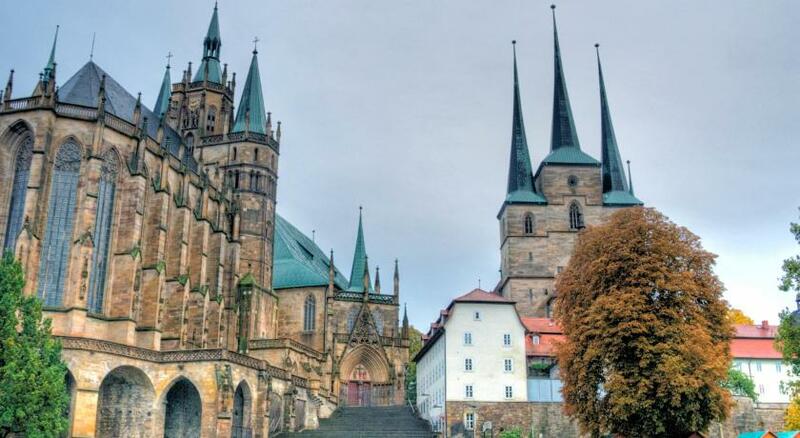 This property also has one of the top-rated locations in Erfurt! Guests are happier about it compared to other properties in the area. 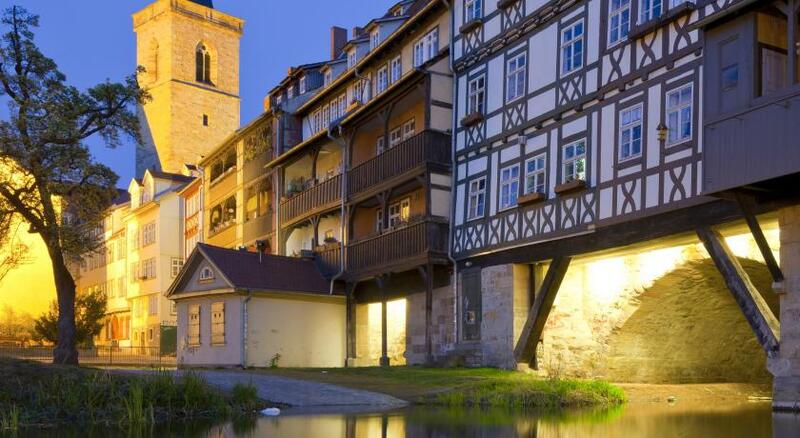 뀐 Located in the top-rated area in Erfurt, this property has an excellent location score of 9.6! When would you like to stay at Villa Altstadtperle Erfurt? Renovated in 2015, this apartment for up to 4 adults features a fully equipped kitchen and a spacious seating area. There is a double bed, a seating area and a large roll-away bed for the 3rd and 4th guest (each 31 in wide x 75 in long). The room features satellite TV and has a private bathroom with a hairdryer and complimentary toiletries. The room features satellite TV and has an private bathroom with a hairdryer and complimentary toiletries. This suite consists of 1 bedroom and 1 living room with a sofa bed for 1 adult or 2 children. A kitchenette is also available. Erfurt’s well-preserved old town has a skyline dotted with church spires and the Erfurter Dom cathedral’s impressive outline. Pass by the river to see old mills and some of the city’s 142 bridges. House Rules Villa Altstadtperle Erfurt takes special requests – add in the next step! All children from 3 to 6 year are charged EUR 5 per person per night in a crib. Villa Altstadtperle Erfurt accepts these cards and reserves the right to temporarily hold an amount prior to arrival. Guests must contact the property if they will be arriving after 18:00 on weekdays and at 15:00 on weekends and holidays. Contact details can be found in the booking confirmation. The owner did not reply to emails and phone calls when I arrived at the hotel. At the end it went ok, after half an hour. My room was quite basic. Doesn't like their mattress & pillow. The shower was a little hard to adjust hot and cold. Lovely big 2room apartment.Private parking for car , pretty garden area and very close to centre of town and large choice of restaurants. Shower drain clogged and disgusting. Due to Central Location very loud at night. I don't carry a phone so finding the reception closed and being told to ring a number was unacceptable. I had to ask a passer-by for assistance. I will not use this hotel again, for that reason. It was my understanding that the owners are building an annex in the rear of the property. Unfortunately there was some construction going on when we were there. That’s what we saw out our window. Excellent breakfast,including home made wurst and pate.